Tsar of Russia, the first tsar of the House of Romanov, being the son of Theodore Nekitich Romanov, afterwards the Patriarch Philaret and Xenia Chestovaya, afterwards the nun Martha. He was elected unanimously tsar of Russia by a national assembly on the 21st of February 1613, but not until the 24th of March did the delegates of the council discover the young tsar and his mohter at the Ipatievsky monastery near Kostroma. At first Martha protested that her son was too young and tender for so difficult an office in such troublesome times. At the last moment, however, Michael consented to accept the throne, but not until the boyars had solemnly declared that if he persisted in their refsual they would hold him responsible to God for the utter destruction of Muscovy. In so dilapidated condition was the capital at this time that Michael had to wait for several weeks at the Troitsa monastery, 75 miles way, before decent accommodation could be provided for him in Moscow. He was crowned on the 22nd of July. The first care of the new tsar was to clear the land of the robbers that infested it. Sweden and Polan were then got rid of respectively by the peace of Stolbova (March 10, 1617) and the truce of Deulina (February 13, 1619). The most important result of the truce of Deulina was the return from exile of the tsar's father, who from that point took over the government until his death in October 1633, Michael occupying quite a subordinate position. He was a gentle and pious prince who gave little trouble to anyone and effaced himself behind his counsellors. Fortunately they were relatively honest and capable men. 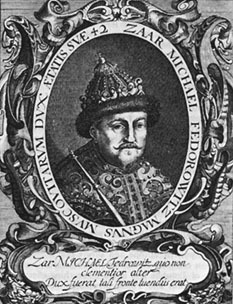 Michael's failure to wed his daughter Irene with Prince Waldemar of Denmark, in consequence of the refusal of the latter to accept orthodoxy, so deeply affected him prior to his death on the 12th of July 1645.